As promised a few days ago, the all-important details for the annual INSTINCTOY Happy Bag release which includes ICE LIQUID, mini Erosion Molly, ICE VINCENT the first release of Booo-Ma. in the early hours of the morning, INSTINCTOY released how to enter the Happy Bag release which contains all 4 soft vinyl figures all with golden touches. The above 4 items will be sold as a set in our >『2018 INSTINCTOY Happy Bag 』. Of course, INSTINCTOY has a special price for it, which is 35,000yen for a set! In general, the price for ICE VINCENT is close to 35,000yen and now INSTINCTOY has extra 3 items packed with it as a set, which is well worth its value. Customers who win INSTINCTOY lottery can say some kind of 『blessing』. The Happy Bag is limited to 77 sets and we hope to let our customers who have been supporting us for a long time enjoy it. There are extra Terms & Conditions, which have been updated as shown below. WHEN: Entry Period: 6th Jan , 2018 till 10th Jan 2359h. After you receive the invoice from us, the payment has to be completed within 1 weeks. ※Please understand the Terms & Conditions before you enter the lottery. ※ This is a limited product, only one lottery entry is accepted for each individual postal address. ※ Please note that bids cannot be cancelled after the entry period is closed. ※ After you receive the invoice from us, the payment has to be completed within 2 weeks. ※The Terms & Conditions for the『GIANT MAGURO』 are the same as previous lotteries, but there are some additions to the Terms & Conditions for the 『2018 Happy Bag』. Please look up INSTINCTOY blog for further details. ※Please note that we will not have a special bag for the Happy Bag. The 4 items will be packaged independently. As these figures are coated by hand, there may be variations in each figure. INSTINCTOY seek your kind understanding in this. Prize announcement: Emails will be posted on 13th Jan, 2018 until 1900h. 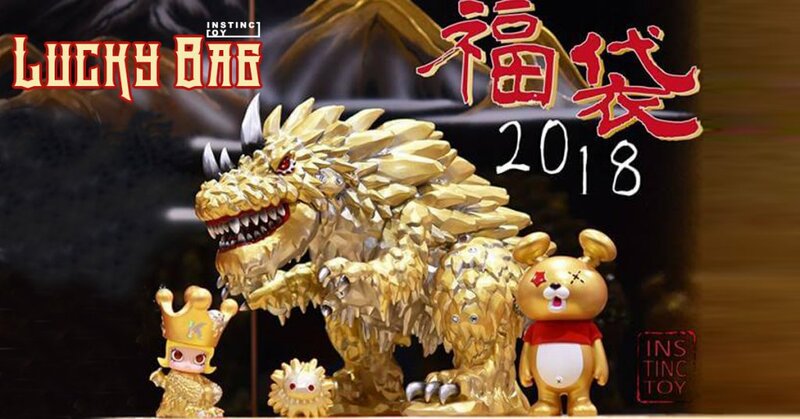 INSTINCTOY will contact the lottery winners on 13th Jan by 1900h. (※ Only winners will receive an announcement mail. After 14th Jan , if you have any questions regarding the lottery result, please contact INSTINCTOY.) We will start shipping on 15th Jan th. ・Customers who want to join our 2018 Happy Bag lottery must have a prior record of lottery applications on our INSTINCTOY INTERNATIONAL on-line system. Only the customers who made more than 2 applications can join our lottery this time.※For customers who applied to win lottery items between 10th ~ 13th Dec 2017, INSTINCTOY will consider it as a single record. http://www.instinctoy.com/ for additional info and soft vinyl goodness.